Oil and gas wells and even cattle release methane gas into the atmosphere, and researchers are working on ways to not only capture this gas but also convert it into something useful and less-polluting. 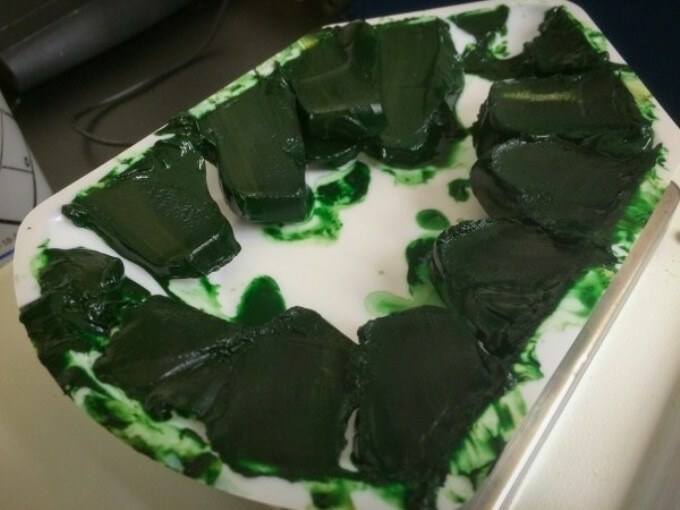 Now scientists at the Department of Energy's Pacific Northwest National Laboratory have developed a new system to convert methane into a deep green, energy-rich, gelatin-like substance that can be used as the basis for biofuels and other bioproducts, specialty chemicals — and even feed for cows that create the gas in the first place. "We take a waste product that is normally an expense and upgrade it to microbial biomass which can be used to make fuel, fertilizer, animal feed, chemicals and other products," said Hans Bernstein, corresponding author of a recent paper in Bioresource Technology. Methane is an unavoidable byproduct of our lifestyle. Manure from dairy cows, cattle and other livestock that provide us food often breaks down into methane. Drilling processes used to obtain the oil and natural gas we use to drive our cars and trucks or heat our homes often vent or burn off excess methane to the atmosphere, wasting an important energy resource. PNNL scientists approached the problem by getting two very different micro-organisms to live together in harmony. One is a methane-loving methanotroph, found underground near rice paddies and landfills — where natural methane production typically occurs. The other is a photosynthetic cyanobacterium that resembles algae. Originally cultured from a lake in Siberia, it uses light along with carbon dioxide to produce oxygen. The two aren't usually found together, but the two co-exist in harmony in a bioreactor at PNNL — thanks to a co-culture system created by Leo Kucek, Grigoriy E. Pinchuk, and Sergey Stolyar as well as Eric Hill and Alex Beliaev, who are two authors of the current paper. PNNL scientist Hans Bernstein collected methane gas from a Washington dairy farm and Colorado oil fields and fed it to the microbes in the bioreactor. One bacterium, Methylomicrobium alcaliphilum 20Z, ate the methane and produced carbon dioxide and energy-rich biomass made up largely of a form of carbon that can be used to produce energy. But Methylomicrobium alcaliphilum 20Z can't do it alone. It needs the other micro-organism, Synechococcus species 7002, which uses light to produce the steady stream of oxygen its counterpart needs to carry out the methane-consuming reaction. Each one accomplishes an important task while supplying the other with a substance it needs to survive. They keep each other happy and well fed — as Bernstein puts it, they're engaging in a "productive metabolic coupling." "The two organisms complement each other, support each other," said Bernstein. "We have created an adaptable biotechnology platform with microbes that are genetically tractable for the synthesis of biofuels and biochemicals." Agricultural and industrial biogas is typically used to generate electricity but engineers have developed ways of upgrading biogas to compressed or liquefied natural gas. But the biogas is typically filled with corrosive impurities like hydrogen sulfide that must be removed before it can be used. The PNNL process produces a much cleaner product, either liquid or solid, with simply the flick of a light switch or exposure to sunlight. When there's methane to convert, the cyanobacteria absorb light and use carbon dioxide as fuel to produce oxygen, fueling the methane-munching bacteria. When there is not much methane, researchers dim the lights, reducing the oxygen, which slows the action of the methanotrophs. In recent tests the PNNL team ran the system continuously for about two months. "The beauty of this system is that it doesn't matter where the methane comes from," said Ron Thomas, deputy director of technology deployment and outreach at PNNL. "It could be agricultural waste; it could be methane from oil wells. The system can take waste from multiple waste streams and create a useful product." The research was funded by DOE's Office of Science (BER) and the Linus Pauling Distinguished Postdoctoral Fellowship Program at PNNL. Cell imaging and sorting were performed at EMSL, the Environmental Molecular Sciences Laboratory, a DOE Office of Science User Facility at PNNL.